Period is an important aspect which this software deals with, as in member, all calculations are done within the period boundary as different financial years may contain different information for the same member. 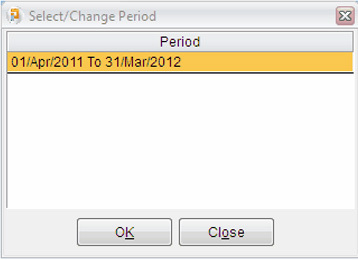 For changing period click change period. You will get one message “Close all other windows before going ahead” which Means you should save all the information of the current operational financial year before jumping to a new financial year else you stand to lose the new information. Select particular period then click ok button, now you will be transferred to the selected period.